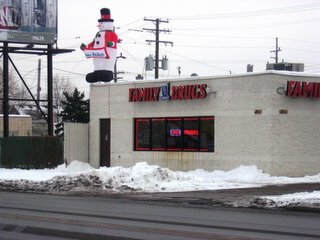 In a previous post, I reported that Frosty the Snowman had fallen down on his job at the Family Drugs (18611 W. Warren Avenue). Since then, I'm proud to say that Frosty is once again standing proud in Warrendale. I'm glad to see that you're doing well, Frosty.